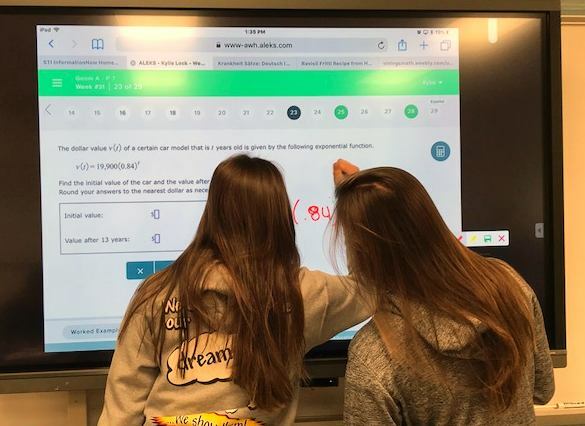 Hauser math teacher, Mrs. Reed, piloted the new interactive display with the support of the Hawcreek-Flat Rock Area Endowment and the FRHC Technology Department. The digital touch screen display allows for the projection of class materials and student work. Additionally, multiple students can write on the board simultaneously. The new display supports Hauser's ongoing 1:1 iPad program. The long term goal is to replace aging display technology with new interactive displays similar to the one piloted by Mrs. Reed and the FRHC Technology Department.